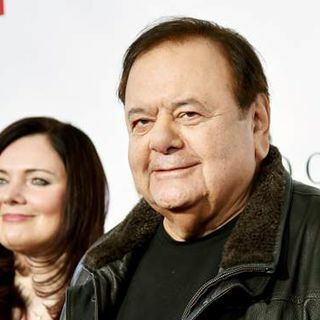 Paul Sorvino and his wife Dee Dee. Paul Anthony Sorvino (born April 13, 1939) is an American actor, opera singer, businessman, writer, and sculptor. He often portrays authority figures on both sides of the law, and is possibly best known for his roles as Paulie Cicero, a portrayal of Paul Vario in the 1990 gangster film Goodfellas, and NYPD Sergeant Phil Cerreta on the police procedural and legal drama television series Law & Order. He is the father of actress Mira Sorvino and actor Michael Sorvino.Sorvino was born and ... See More raised in Brooklyn, New York City. His mother, Angela Maria Mattea (née Renzi), was a homemaker and piano teacher, who was born in Connecticut, of Italian (Molisan) descent. His father, Ford Sorvino, was an Italian (Neapolitan) immigrant who worked in a robe factory as a foreman. He attended Lafayette High School, where he was classmates with painter Peter Max, and the American Musical and Dramatic Academy.He began his career as a copywriter in an advertising agency, where he worked with John Margeotes, founder of Margeotes, Fertitta, and Weiss. He took 18 years of voice lessons. While attending The American Musical and Dramatic Academy, he decided to go into the theatre. He made his Broadway debut in the 1964 musical Bajour, and six years later he appeared in his first film, Carl Reiner's Where's Poppa? starring George Segal and Ruth Gordon. In 1971, he played a supporting role in Jerry Schatzberg's critically acclaimed The Panic in Needle Park starring Al Pacino and Kitty Winn. He received an avalanche of critical praise for his performance as Phil Romano in Jason Miller's 1972 Broadway play That Championship Season, a role he repeated in the 1982 TCS film version. In a 1974 ABC Movie of the Week, he played Harry Walters, a stout real estate salesman, who is randomly picked up by a beautiful woman (JoAnna Cameron) and raped at gunpoint as a prank, and left to explain to his friend (Adam Arkin) and wife (Michael Learned) how It Couldn't Happen to a Nicer Guy, a movie considered risqué, even for the '70s. He also appeared in the 1976 Elliott Gould/Diane Keaton vehicle I Will, I Will... for Now. He has starred in the weekly series We'll Get By (1975, as George Platt), Bert D'Angelo/Superstar (1976, in the title role) and The Oldest Rookie (1987, as Detective Ike Porter). He also directed Wheelbarrow Closers, a 1976 Broadway play by Louis La Russo II, which starred Danny Aiello.In 1981, Sorvino played the role of Italian-American Communist Louis C. Fraina in Warren Beatty's epic film Reds. He appeared in Larry Cohen's 1985 science fiction horror film The Stuff as a reclusive militia leader, alongside his future Law & Order co-star Michael Moriarty. He helped found the American Stage Company, a group that launched several successful Off-Broadway shows, while living in Tenafly, New Jersey in 1986. In 1991, he took on the role of Sergeant Phil Cerreta (replacing actor George Dzundza in a new role) on the popular series Law & Order. Sorvino was initially excited about the role, but would leave after 29 episodes, citing the exhausting schedule demanded by the filming of the show, a need to broaden his horizons, and the desire to preserve his vocal cords for singing opera. Sorvino's exit from the series came in an episode in which Sgt. Cerreta was shot in the line of duty and transferred to an administrative position in another precinct. He was replaced on the show by Jerry Orbach (as Detective Lennie Briscoe). In 1993, Sorvino subbed for the late Raymond Burr in a Perry Mason TV movie. He earlier appeared as Bruce Willis' father in the weekly series Moonlighting, and the "Lamont" counterpart in the never-aired original pilot for Sanford and Son. Some of his most notable film roles were caporegime Paul Cicero in Martin Scorsese's Goodfellas (1990) and Henry Kissinger in Oliver Stone's Nixon (1995). In addition to Goodfellas, Sorvino also played mob bosses Eddie Valentine in The Rocketeer and Tony Morolto in The Firm.Sorvino founded the Paul Sorvino Asthma Foundation, with the goal of building asthma centers for children and adults across the United States. In 1998, he narrated the series "The Big House" for The History Channel. In 1999, he directed and again starred in (albeit playing a different role) a lower-budget TV version of That Championship Season, which was written by his friend Jason Miller. He also lent his voice in Hey Arnold! : The Movie as the main antagonist, Mr. Scheck, the evil CEO of Future Tech Industries who wants to convert Arnold's neighborhood into a huge shopping mall. From 2000 to 2002, he had a starring role as Frank DeLucca in the CBS television drama That's Life. He also starred in the CBS comedy Still Standing as Al Miller, father to Bill (Mark Addy). He filmed The Trouble with Cali in the Scranton/Wilkes-Barre area of Pennsylvania. He is directing and starring in the film which is partially funded by Lackawanna County, of which the city of Scranton is the county seat. His daughter, Mira, also stars in the film. He co-ventured with Peter Margo, the founder of Palmer Video, to form CareFromAll.org to raise funds for his charity. Sorvino played GeneCo founder Rotti Largo in the 2008 musical film Repo! The Genetic Opera. Working with Repo! director Darren Lynn Bousman again, Sorvino plays God  in The Devil's Carnival, a short film screened on tour beginning in April, 2012.